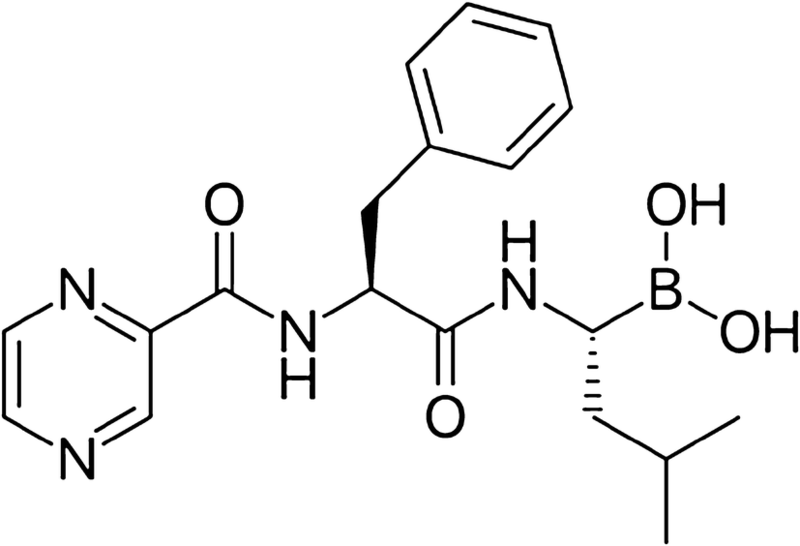 Bortezomib is a dipeptidyl boronic acid that selectively inhibits the ubiquitin proteasome pathway, which plays a role in the degradation of many intracellular proteins. It is the first-in-class selective and reversible inhibitor of the 26S proteasome, with antiproliferative and antitumor activity. It exerts its anti-neoplastic action mainly via the inhibition of the nuclear factor-κB pathway components associated with cell proliferation, apoptosis, and angiogenesis. The drug has revolutionized the treatment of multiple myeloma and, more recently, mantle cell lymphoma. In 2003, bortezomib received accelerated approval from the US Food and Drug Administration for the treatment of relapsed/refractory multiple myeloma and in 2008 for patients with previously untreated multiple myeloma. In 2006, bortezomib was approved for the treatment of refractory/relapsed mantle cell lymphoma and, in 2014, for previously untreated mantle cell lymphoma. Bortezomib has also demonstrated clinical efficacy both as a single drug and in combination with other agents in light chain amyloidosis, lymphoplasmacytic lymphoma/Waldenstrom macroglobulinemia, and peripheral T-cell lymphomas. Furthermore, continued clinical studies are required to confirm its value for patients with indolent and aggressive B-cell non-Hodgkin lymphomas and acute leukemias. Bortezomib has antiproliferative and antitumor activity by inhibiting the proteasomal degradation of several regulatory ubiquitinated proteins. Bortezomib has clinical activity in multiple myeloma, mantle cell lymphoma, Waldenstrom macroglobulinemia, T-cell lymphoma amyloidosis, and other lymphoproliferative disorders. Ongoing studies are currently evaluating combination regimens involving either cytotoxic or targeted therapies in lymphoid malignancies. Bortezomib (Velcade®) is a dipeptidyl boronic acid that selectively inhibits the ubiquitin proteasome pathway, which plays a role in the degradation of many intracellular proteins (Fig 1). It is the first-in-class selective and reversible inhibitor of the 26S proteasome: a multisubunit protein that degrades proteins involved in multiple cellular processes, including cell-cycle regulation, transcription factor activation, and apoptosis [1, 2]. It has revolutionized the treatment of multiple myeloma (MM, plasma cell myeloma) and, more recently, mantle cell lymphoma (MCL). Bortezomib was co-developed by Millennium/Takeda and Janssen Pharmaceutical Companies and now is also available as a generic drug. Despite being initially developed as an anti-inflammatory and anti-cachectic agent, it was found to possess antitumor activity in the late 1990s . Bortezomib exerts substantial anti-myeloma activity when it is used as a single drug or in combination with other anti-cancer agents in both patients with previously untreated MM and in patients with relapsed/refractory MM [4, 5, 6, 7, 8, 9]. In 2003, 7 years after the initial synthesis, bortezomib received accelerated approval from the US Food and Drug Administration (FDA) for the treatment of patients with MM progressing after two prior therapies . Following this, it received regular approval from the FDA for the treatment of MM progressing after at least one prior therapy in March 2005, and for patients with previously untreated MM in 2008 . In 2006, bortezomib was approved for the treatment of refractory/relapsed MCL and in 2014, for patients with previously untreated MCL. In 2014, the FDA approved the retreatment of adult patients with MM whose disease had previously responded to bortezomib therapy but had relapsed at least 6 months after completion. In 2014, it was also approved for use in patients with previously untreated MCL (Table 1) . In the previous 3 years, several generic equivalents of Velcade have become available. In 2015, the European Commission granted a marketing authorization for Bortezomib Accord (Accord Healthcare Ltd.) and in 2016 for Bortezomib Sun [SUN Pharmaceutical Industries (Europe) B.V.] and Bortezomib Hospira. The implementation of generic forms of bortezomib could massively reduce its price and widen its use, even in lower income countries . In this review, we present the current status of bortezomib with regard to hematologic malignancies and outline future directions for its clinical use. Bortezomib has a high degree of selectivity for the proteasome and does not inhibit several other proteases [14, 15]. It realizes its antiproliferative and antitumor activity by inhibiting the proteasomal degradation of several regulatory ubiquitinated proteins [16, 17]. This inhibition is achieved by bortezomib binding to the catalytic site of the 26S proteasome, which it achieves with high affinity and specificity. Bortezomib treatment has been associated with induction of mitochondrial depolarization and apoptosis . Bortezomib inhibition of the proteasome results in increased intracellular levels of p27 and p53; in addition, bortezomib also induces cell death through the inhibition of nuclear factor-κB activity, accumulation of misfolded proteins, the activation of c-Jun N-terminal kinase, and stabilization of cell-cycle inhibitors [19, 20, 21, 22, 23]. Bortezomib can be administered both intravenously and subcutaneously ; however, subcutaneous administration is now recommended based on results of a large, randomized, phase III non-inferiority trial (MMY-3021 trial) performed in 222 patients with relapsed MM, which found subcutaneous bortezomib to induce similar overall response (OR) rate, time to progression, and 1-year overall survival (OS) as intravenous administration . In addition, subcutaneous administration was associated with improved tolerability, especially a reduction in peripheral neuropathy in comparison with intravenous administration. The approach is also more convenient for patients. Importantly, renal insufficiency does not influence the safety or efficacy of bortezomib , nor does impairment of hepatic function significantly influence its pharmacodynamic effect . The reduction in bortezomib administration frequency from twice weekly to once weekly in combination regimens did not reduce its efficacy but can improve safety [27, 28, 29]. Palumbo et al. compared these two methods of bortezomib infusions in a phase III trial in patients with previously untreated MM . The complete response (CR) rate was 30% in the patients treated once weekly and 35% in the patients receiving twice-weekly infusions (p = 0.27). Three-year progression-free survival (PFS) was also similar (50% vs. 47%, respectively, p = 1.00) as well as OS (88% vs. 89%, p = 0.54). Nonhematologic grade 3/4 adverse events (AEs) were observed in 35% of once-weekly treated patients and 51% of twice-weekly treated patients (p = 0.003). In addition, grade 3/4 peripheral neuropathy was observed in 8% of patients in the once-weekly group and 28% of patients in the twice-weekly group (p < 0.001). The use of bortezomib is associated with an increased risk of varicella zoster virus infection and the use of acyclovir or valacyclovir prophylaxis is recommended [31, 32]. Continuous prophylaxis by daily, oral, ultra-low-dose acyclovir 200 mg/day in patients with MM receiving bortezomib treatment can be effective and sufficient in preventing varicella zoster virus . Although bortezomib treatment has generally offered encouraging results, primary and secondary resistance are emerging problems, with most patients demonstrating drug-resistant relapse following long-term treatment. In addition, primary resistance is also observed and refractoriness to bortezomib is a negative prognostic factor . Resistance has been attributed to several factors, including genetic mutations, clonal evolution of MM cells, and bone marrow microenvironment changes [35, 36, 37, 38, 39, 40, 41, 42, 43, 44, 45, 46, 47]. In preclinical studies, upregulation of the proteasomal system in bortezomib-resistant acute myeloid leukemia (AML) and MM model cell lines has been observed . Several reports attribute the functional responsibility for the chymotrypsin-like activity of the proteasome to the presence of point mutations of the PSMB5 gene, which encodes for the β5 subunit of the proteasome [36, 37, 38, 39]. Another mechanism related to primary bortezomib resistance is the post-translational modification and the loss of the chromosomal region 8p21, causing increased expression of C-MAF and MAF-B proteins . In patients with a high expression of these proteins, significantly poorer response to bortezomib was observed. It has been found that while 50% of patients with del(8)(p21) responded to treatment with bortezomib, a response was observed in 90% of patients without this mutation . Increased expression of the proteasome maturation protein has been observed in cell lines resistant to bortezomib . Proteasome maturation protein expression is essential for de novo biogenesis of the proteasome, and its increased expression is one route by which bortezomib resistance is acquired [49, 50]. Another protein with a significant impact on resistance to bortezomib is the X-box binding protein 1 (XBP1), which is a transcription factor necessary for the final maturation of plasmablasts to plasmocytes and the secretion of immunoglobulin . X-box binding protein 1 also regulates the UPR mechanism by activating genes necessary for UPR activation. Low levels of XBPS1 gene expression have been found to correlate with a lack of sensitivity to bortezomib treatment. Two point mutations in the XBP1 gene have been identified in cases of MM . The XBP1-L167I mutation has been shown to prevent the XBP1 messenger RNA splicing process creating the active form of the XBP1s protein . Cells displaying XBP1 gene mutations lose their sensitivity to bortezomib, thus resulting in the acquisition of disease resistance . Myristoylated alanine-rich C-kinase substrate is a membrane protein that may serve as a possible indicator of bortezomib resistance. Increased myristoylated alanine-rich C-kinase substrate protein expression has been observed in the PCM 8226R5 cell line and in MM cells from some patients refractory to bortezomib . RPL5 gene expression is also a biomarker associated with response to bortezomib therapy : the RPL5 gene itself was identified in 20–40% of patients with MM and its low expression was found to correlate with longer PFS in patients with MM treated with bortezomib . In addition, low RPL5 expression levels correlated with longer survival in newly diagnosed and relapsed patients treated with bortezomib. Multiple myeloma is a malignant hematologic disorder characterized by the clonal proliferation of plasma cells. The annual incidence of MM is 4.5–6 cases per 100,000 . Its treatment has changed dramatically in recent years, with the introduction of new drugs, both in the front-line setting and in relapsed refractory disease. One of the main backbone agents of antimyeloma treatment is bortezomib. Bortezomib is effective in patients with previously untreated MM, including high-risk patient subgroups such as older patients with comorbidities, patients with renal insufficiency, and those with poor-risk cytogenetics including t(4;14) or del(17p) [51, 52]. Based on the results of current phase III trials, three-drug combinations including bortezomib and dexamethasone are recommended as the standard induction regimens prior to autologous stem cell transplantation (ASCT) in previously untreated patients (Table 2) [53, 54, 55, 56, 57, 58]. Preferred primary regimens for transplant candidates are bortezomib/thalidomide/dexamethasone (VTD), bortezomib/cyclophosphamide/dexamethasone (VCD), bortezomib/doxorubicin/dexamethasone (PAD), and bortezomib/lenalidomide/dexamethasone [60, 61, 62, 63, 64, 65, 66, 67]. Several phase III trials compared the efficacy and safety of bortezomib-based triplet regimens in suitable patients with previously untreated ASCT (Table 2). Bortezomib/cyclophosphamide/dexamethasone have been shown to be noninferior to PAD in transplant-eligible patients . The OR rate was 72.1% in the PAD group and 78.1% in the VCD arm (p = 0.15). However, VCD more commonly led to grade ≥3 leukocytopenia and/or neutropenia (VCD 35.2% vs. PAD 11.3%, p = 0.001). In another head-to-head comparison, VTD resulted in higher response rates than VCD in patients with newly diagnosed MM before high-dose therapy and ASCT (61). The OR rate was significantly higher in the VTD arm (92.3% vs. 83.4% in the VCD arm; p = 0.01) including very good partial response (VGPR) 66.3% vs. 56.2%, respectively (p = 0.05). Significantly increased rates of grade 3 and 4 anemia, thrombocytopenia, and neutropenia were observed in the VCD arm. Bortezomib/lenalidomide/dexamethasone is not considered a standard treatment for MM in Europe, owing to a lack of approval by the European Medicines Agency . More recently, monoclonal antibodies, elotuzumab or daratumumab, added to bortezomib triplet induction combinations are investigated with the aim to further increase the deep of remission prior to ASCT. Consolidation and maintenance therapy with bortezomib following ASCT is associated with increased PFS and OS, especially in patients with high-risk disease . A recent study indicated that bortezomib consolidation therapy is effective in delaying disease progression and improving the quality of responses in newly diagnosed patients following ASCT, regardless of prior bortezomib exposure and is generally well tolerated . Patients aged 70 years and older are usually considered ineligible for ASCT. According to the current National Comprehensive Cancer Network Clinical Practice Guidelines, preferred regimens for those patients are VCD, bortezomib/lenalidomide/dexamethasone, and lenalidomide/low-dose dexamethasone . Bortezomib/lenalidomide/dexamethasone for transplant-ineligible patients with PCM improves PFS and OS in comparison with lenalidomide and dexamethasone . In certain circumstances, bortezomib combined with dexamethasone is also useful in older patients unsuitable for ASCT. Dublet or triplet bortezomib-based combinations such as bortezomib/dexamethasone (VD), VTD, bortezomib/melphalan/prednisone, bortezomib/thalidomide/prednisone (VTP), bortezomib/melphalan/prednisone/thalidomide, and bortezomib/thalidomide (VT) are used in clinical practice. In the large randomized study, VTP plus daratumumab was compared with VTP alone in 706 patients with newly diagnosed MM who were ineligible for ASCT . The OR rate was 90.9% in the daratumumab group and 73.9% in the control group and the CR rate was 42.6% and 24.4%, respectively (p < 0.001). At a median follow-up of 16.5, the 18-month PFS rate was 71.6% in the VTP plus daratumumab group and 50.2% in the VTP alone group (p < 0.001). Recently, daratumumab in combination with bortezomib, melphalan, and prednisone (DVMP) was approved by both the FDA and European Medicines Agency for patients with newly diagnosed MM who are unsuitable for ASCT, based on the Alcyone study (Table 2) [65, 72]. There are several effective therapeutic options with bortezomib for relapsed or refractory MM patients (Table 2) [4, 7]. Patients who relapsed at least 6 months after the last dose of bortezomib and are bortezomib sensitive can receive bortezomib in combination with dexamethasone as re-treatment . A group of patients with MM retreated with bortezomib were found to demonstrate an OR rate of 40%, a median duration of response of 6.5 months, and a median time to progression of 8.4 months . However, in patients with relapsed MM, the dublet or triplet bortezomib-containing regimens are more commonly used (Table 2). The treatment choice depends on the previously used regimens, expected efficacy, toxicity, and the fitness of the patient. Immunomodulatory drugs, particularly lenalidomide in combination with low-dose dexamethasone, are the standard treatment for relapsed patients who received first-line treatment with bortezomib [73, 74]. However, in routine clinical practice, combinations of bortezomib with thalidomide and dexamethasone (VTD), lenalidomide and dexamethasone, or cyclophosphamide and dexamethasone (VCD) are still commonly used [75, 76]. The VTD regimen has been shown to be superior to thalidomide and dexamethasone in patients relapsed after ASCT . However, the presence of comorbidities, particularly, peripheral polyneuropathy justifies the use of an alternative regimen. In relapsed/refractory patients, VD (bortezomib plus dexamethasone)-based triplet regimens, including the VD combination with pomalidomide (PVD), daratumumab, elotuzumab, or panobinostat is more effective compared with standard VD therapy (Table 2) [7, 14, 75, 76, 77, 78, 79, 80, 81, 82, 83, 84]. Progression-free survival at 12 months was 60.7% in the daratumumab arm and 26.9% in the control group. However, it is not clear whether these combinations are active in bortezomib-refractory disease. In addition, bortezomib-induced neuropathy is a common contraindication for retreatment. Several new agents have been recently approved or are under investigation for patients with relapsed and refractory MM, previously treated with bortezomib [78, 85, 86, 87, 88, 89]. These include the next-generation immunomodulatory drug pomalidomide, the human IgGκ monoclonal antibody daratumumab, used to target CD38, and elotuzumab, a humanized monoclonal antibody directed against signaling lymphocytic activation molecule F7. In patients with at least one previous line of therapy, daratumumab combined with bortezomib-dexamethasone (CASTOR trial) significantly prolonged PFS and induced higher response rates in comparison with VD . After a median follow-up of 19.4 months, daratumumab plus bortezomib and dexamethasone prolonged PFS by 9.6 months in comparison with VD alone (median: 16.7 vs. 7.1 months; p < 0.0001). The OS rate has also been improved (83.8% vs. 63.2%; p < 0.0001). Elotuzumab is another monoclonal antibody that has been combined with bortezomib. In a phase II study, elotuzumab was combined with bortezomib and dexamethasone and compared with elotuzumab alone . The OR rate was 66% for patients treated with elotuzumab/bortezomib/dexamethasone and 63% for patients treated with VD. Median PFS was 9.7 months vs. 6.9 months, respectively, elotuzumab plus bortezomib and dexamethasone is a National Comprehensive Cancer Network recommended alternative option for relapsed or refractory MM. However, a phase III study is needed to confirm the place of the elotuzumab/bortezomib/dexamethasone combination in relapsed/refractory patients with MM. The pomalidomide, bortezomib, and low-dose dexamethasone (PVD) regimen has been also investigated in a randomized trial (OPTIMISMM study) and has shown promising activity (Table 2) . The OR rate was 85.9% with PVD vs. 50.8% with VD in the patients refractory to lenalidomide (p < 0.001) and 95.7% vs. 60.0% in patients not refractory to lenalidomide (p < 0.001). Median PFS was 17.8 months with PVD and 9.5 months with VD in patients refractory to lenalidomide. In lenalidomide-nonrefractory patients, PFS was 22.0 and 12.0 months, respectively. The most common AEs were neutropenia, thrombocytopenia, and anemia and were more common with PVD than VD. Light-chain (AL) amyloidosisis is a plasma cell disorder characterized by the production of monoclonal light chains, usually λ type, which results in the formation of amyloid aggregates . The disease is caused by the formation of a pathological plasma cell clone leading to the deposition of amyloid fibrils in the kidney, heart, liver, nerves, and other tissues. Pre-clinical studies have documented that the plasma cells of patients with AL amyloidosis are highly sensitive to bortezomib . Subsequently, several studies have documented that bortezomib with or without dexamethasone is an effective regimen for the treatment of this disease (Table 3) [92, 93, 94, 95, 96, 97, 98]. 71.0 vs. 79.7 (p = 0.32). A study of 94 previously treated patients with AL amyloidosis from three national centers treated with bortezomib alone or combined with dexamethasone found bortezomib treatment to yield rapid and good-quality responses . A hematologic OR was achieved in 71% of patients including 25% CRs. The previously untreated patients obtained a 47% CR rate and a cardiac response was observed in 29%. The 1-year survival rate was 76% and median survival has not been reached. Toxicity mostly consisted of neuropathy, orthostasis, peripheral edema, and constipation or diarrhea, but was manageable. In addition, a recent systematic review and meta-analysis of eight studies and 617 patients demonstrated that bortezomib treatment improves OR rate, CR rate, cardiac response rate, survival rate, and the risk of neuropathy compared with controls without bortezomib therapy . Two other studies also evaluated the use of the VCD combination [95, 99]. The OR rates ranged from 81% to 94%. However, many of these patients were treated with twice-weekly bortezomib and dexamethasone, 20–40 mg per week, which seems to be too toxic in AL amyloidosis. Currently, VCD is recommended as a first-line treatment in AL amyloidosis. However, it is not clear whether the addition of cyclophosphamide to VD is important in newly diagnosed, previously untreated patients; indeed, the addition of a third agent to VD may not improve outcomes but may increase toxicity, especially in older patients with significant comorbidities. A recent study compared the effects of treating 101 patients with AL amyloidosis with VD (59 patients) or VCD (42 patients). The results indicate that for the VD regimen, low dexamethasone doses were equally as effective as higher doses; furthermore, efficacy was not improved by the addition of cyclophosphamide (VCD) . A hematologic response was achieved in 68% of patients treated with VD and 78% treated with VCD (p = 0.26). The CR plus VGPR rate was achieved in 47% of VD-treated patients and 35% of VCD-treated patients. In addition, no difference was observed in early mortality. Importantly, the administration of higher doses of dexamethasone or twice-weekly bortezomib was not associated with any improvement in obtaining CR plus VGPR. Median survival was also similar (33 vs. 36 months, p = 0.45). The European collaborative group reported “real-word” study results of 230 unselected patients treated frontline with VCD at two referral centers . Hematologic OR was achieved in 60% of the patients with measurable disease and at least VGPR was observed in 43%. Venner et al. compared VCD with risk-adapted cyclophosphamide, thalidomide, and dexamethasone in previously untreated patients with AL amyloidosis . The CR rate was higher in the VCD arm (40.5%) than in the cyclophosphamide, thalidomide, and dexamethasone arm (24.6%) (p = 0.046). However, the OR rate and the 1-year OS rate were similar for VCD and cyclophosphamide, thalidomide, and dexamethasone. Palladini and colleagues compared the outcome of patients treated with bortezomib, melphalan, and dexamethasone with those treated with melphalan and dexamethasone . A higher CR rate was observed with bortezomib, melphalan, and dexamethasone (42%) than with melphalan and dexamethasone (19%), but OS was similar in the two groups. Israeli investigators reported the outcome of 73 consecutive, non-selected ‘real-world’ patients with AL amyloidosis treated with first-line bortezomib-based induction, mostly with concurrent administration of alkylating drugs (68%) . Hematologic response was obtained in 77% of patients, including 33% VGPR and 19% CR. Patients receiving an alkylating agent and those with organ response demonstrated significantly improved survival. In addition, the combination with alkylating drugs did not increase toxicity. A recent study examining the effects of bortezomib/dexamethasone as first-line treatment found that patients with AL amyloidosis with t(11;14) demonstrated poorer hematologic event-free survival (median, 3.4 months) than those without t(11;14) (median 8.8 months; p = 0.002) . The OR rate was 23% vs. 47%, respectively (p = 0.02), and median OS was 8.7 months vs. 40.7 months, respectively (p = 0.05). Similarly, a multi-institutional study of VCD used as upfront therapy in patients with high-risk cardiac AL amyloidosis (Mayo Clinic stage III) by Jaccard et al. found a 1-year OS of 57% among 41 tested patients at a median follow-up of 16 months. These results compare favorably with previously reported data. The above studies indicate that these bortezomib regimens are effective treatments for AL amyloidosis, even when the dose of dexamethasone is low. However, it is not clear whether higher doses of dexamethasone and the addition of alkylating agents markedly improve the therapeutic effect of bortezomib. In addition, the presence of t(11;14), is associated with lower efficacy of bortezomib-based regimens. Further studies are needed to establish the optimal use of bortezomib in the treatment of this disease. Bortezomib as a single drug is active in patients with untreated or relapsed lymphoplasmacytic lymphoma/Waldenstrom macroglobulinemia (WM) in schedules based on twice-weekly administration in 2 of 3 weeks [104, 105]. In a phase II study, bortezomib was given at a dose of 1.3 mg/m2 intravenously on days 1, 4, 8, and 11 in a 21-day cycle in patients with untreated or relapsed WM . The OR rate was 26% among 27 included patients. The most common AE was peripheral neuropathy, including five patients with grade 3 events. A higher OR rate with a similar dosing schedule was observed by Treon et al. in 27 patients with relapsed/or refractory disease ; they report an OR rate of 85%, with ten patients achieving minor responses and 13 major responses. The median time to progression was 7.9 months. The most common grade III/IV toxicities were sensory neuropathies (22.2%), leukopenia (18.5%), and neutropenia (14.8%). Bortezomib is more effective when administered once weekly for 4 weeks in combination with other agents . Ghobrial et al. treated 27 patients with relapsed or refractory WM with bortezomib 1.6 mg/m2 intravenously per week on days 1, 8, and 15, every 28 days for six cycles, and with rituximab 375 mg/m2 weekly on cycles 1 and 4 . Responses were observed in 81% of patients, including two CR/near CR and 17 (46%) partial responses (PR). The median PFS was 15.6 months and the median OS has not been reached to date. Importantly, no grade 3 or 4 neuropathy was seen with the weekly bortezomib schedule. Other bortezomib combinations have also been evaluated in relapsed/refractory WM [109, 110]. Bortezomib is even more effective in previously untreated patients with MW. Treon et al reported the results of bortezomib, dexamethasone, and rituximab in 23 patients with symptomatic untreated WM . The OR rates were 96% and major response rates were 83% with three CR. With a median follow-up of 22.8 months, 18 of 23 patients remained free of disease progression. The European Myeloma Network also reported outcomes of bortezomib, dexamethasone, and rituximab treatment in previously untreated patients with WM . The response rate was 85% including 3% CR, 7% VGPR, and 58% PR. The median PFS was 42 months, and the 3-year OS was 81%. Peripheral neuropathy was seen in 46% of patients. After a minimum follow-up of 6 years, median PFS was 43 months and OS at 7 years was 66% . Mantle cell lymphoma is an incurable subtype of non-Hodgkin lymphoma (NHL) characterized by an advanced stage at diagnosis, most frequently stage III or IV, with extensive lymphadenopathy and splenomegaly. Two treatment options widely used in newly diagnosed patients with MCL ineligible for intensive chemotherapy and ASCT are cyclophosphamide, doxorubicin, vincristine, and prednisone in combination with rituximab (R-CHOP), and bendamustin combined with rituximab. Single-agent bortezomib has demonstrated clinical efficacy in relapsed and refractory MCL . In previously untreated patients, the addition of bortezomib to induction chemotherapy is also promising . Although bortezomib was found to demonstrate some activity in previously untreated MCL patients when given as a single agent , most trials have investigated its use in combination with other agents. In an initial prospective phase I/II study, bortezomib was combined with R-CHOP in 36 previously untreated patients with MCL . Overall response was achieved in 91% of patients and CR was achieved in 72% of patients. Median PFS was 23 months, and median OS was not reached. Similar results were observed in the SWOG phase II study, in which R-CHOP was combined with bortezomib induction in 65 previously untreated patients with MCL, with bortezomib then given as maintenance therapy . After 2 years, PFS was 62% and OS was 85%. Tolerability was acceptable with mainly hematologic toxicity noted. A more recent paper examined the effect of replacing vincristine with bortezomib in R-CHOP therapy (VR-CAP) for previously untreated patients with MCL unsuitable for bone marrow transplantation as part of a large, randomized, phase III LYM-3002 study (Table 4) [117, 118, 119, 120]. Eligible patients were randomized to receive six to eight 21-day cycles of R-CHOP or VR-CAP. In the VR-CAP regimen, bortezomib was given intravenously on days 1, 4, 8, and 11. The CR rate was 53% in the VR-CAP arm and 42% in the R-CHOP arm (p = 0.007). Progression-free survival was 24.7 months and 14.4 months, respectively (p < 0.001), when evaluated by the independent review committee. The median treatment-free interval was 40.6 months in the VR-CAP arm and 20.5 months in the R-CHOP arm (p < 0.001) . Similar differences were noted in the median time to next therapy: 44.5 vs. 24.8 months, respectively (p < 0.001). In addition, with a median follow-up of 82 months, median OS improved significantly, and was approximately 3 years longer in the VR-CAP (90.7 months) than the R-CHOP group (55.7 months; p = 0.001) . Serious AEs were observed in 38% of the patients treated with VR-CAP and 30% of the patients treated with R-CHOP. Hematologic toxicity was also more common in the VR-CAP arm than the R-CHOP arm. Grade ≥3 neutropenia was noted in 85% of patients in the VR-CAP arm and 67% in the R-CHOP arm, and grade ≥3 thrombocytopenia was observed in 57% (VR-CAP) and 6% (R-CHOP) of patients. Another study evaluated bortezomib combined with rituximab and cyclophosphamide, doxorubicin, vincristine, and dexamethasone followed by maintenance rituximab in previously untreated patients with MCL . The OR rate was 95%, CR was 68%, and the 3-year PFS was 72%. Recently, Gressin et al. presented results of a prospective, multicenter, phase II study evaluating rituximab, bendamustine, bortezomib, and dexamethasone in previously untreated patients with MCL aged 65 years or older (Table 4) . After six cycles of treatment, 87% (47/54) of responding patients were negative for peripheral blood residual disease. With a median follow-up of 52 months, the 2-year PFS was 70%. As a single agent, bortezomib has shown substantial clinical activity in relapsed and refractory patients with MCL with response rates of up to 46% in phase II trials (Table 4) [123, 124, 125, 126, 127, 128, 129]. In the pivotal, multicenter, international single-arm, phase II M34103-053 (PINNACLE) study, bortezomib was given at a dose of 1.3 mg/m2 on days 1, 4, 8, and 11 of a 3-week cycle, for up to 17 cycles [126.127]. A total of 155 subjects with a median age of 65 years were enrolled at 35 study centers. The OR rate was 33%, CR was 8%, and median PFS was 9.2 months. Grade 3 or higher AEs were peripheral neuropathy (13%), fatigue (12%), and thrombocytopenia (11%). The updated results after a median follow-up of 26.4 months confirmed that single-agent bortezomib offers substantial activity in patients with relapsed or refractory MCL . Median OS in all patients was 23.5 months and median OS in responding patients was 35.4 months. Combining bortezomib with other agents increases its efficacy (Table 4) [128, 129, 130, 131, 132, 133, 134, 135, 136, 137, 138]. Furtado et al. evaluated the combination of bortezomib with cyclophosphamide, doxorubicin, vincristine. and prednisone (CHOP) in relapsed MCL . The treatment significantly improved outcome with a manageable increase in toxicity. The CHOP regimen combined with bortezomib 1.6 mg/m2 was also compared with CHOP alone, with OR rates of 82.6% achieved in the CHOP-bortezomib arm and 47.8% in the CHOP arm (p = 0.01) and respective CR rates of 34.8% and 21.7%. Median OS values were 35.6 months in patients treated with CHOP plus bortezomib and 11.8 months in patients treated with CHOP (p = 0.01). Importantly, neuropathy was not found to be significantly higher in the CHOP-bortezomib arm (6.5%) than the CHOP arm (4.3%). In other studies, bortezomib was combined with bendamustine and rituximab in heavily pretreated patients with relapsed or refractory MCL and indolent NHL . The OR rate was found to be 83%, including 15 patients with CR and 47% displaying 2-year PFS. Bortezomib was also combined with chemotherapy comprising fludarabine, liposomal doxorubicin, and rituximab in patients with relapsed MCL,  yielding an OR rate of 73.3% including a 60.0% CR rate. Other small phase II studies of bortezomib combinations have also been performed, including combinations with high-dose cytarabine (Ara-C) and dexamethasone, gemcitabine, obatoclax mesylate, or lenalidomide [131, 136, 138]. However, the promising results achieved in these small trials require confirmation with larger numbers of patients. In addition, preclinical experiments indicate synergistic action of bortezomib with other targeted drugs including rituximab, lenalidomide, ibrutinib, and other agents. The early results of clinical trials suggest that these combinations are effective [139, 140, 141, 142]. Bortezomib was approved by the FDA in December 2006 for the treatment of patients with MCL who have received at least one prior therapy, and in 2014, in both USA and the European Union for patients with previously untreated MCL (Table 5). Indolent NHL may comprise approximately 25% of all new NHL cases. The most common is follicular lymphoma (FL), representing 75% of indolent NHLs. Rarer forms include marginal zone lymphoma, small lymphocytic lymphoma, and lymphoplasmacytic lymphoma . In most cases, indolent NHL is not curable. When used as a single agent, bortezomib demonstrates activity in patients with relapsed/refractory FL and in heavily pretreated patients with relapsed/refractory indolent lymphoma. A large study conducted on patients with relapsed/refractory FL returned an OR rate of 50% after bortezomib monotherapy given at a dose of 1.5 mg/m2 on days 1, 4, 8, and 11 [126, 127]. In previously-untreated indolent NHL, bortezomib/rituximab therapy is well tolerated and has resulted in long-term survival rates similar to those associated with standard immunochemotherapy regimens. Bortezomib combined with rituximab displayed feasibility, long-term efficacy, and good tolerability in patients with relapsed FL. In a phase II study, 45 patients received a total of six cycles of therapy . The OR rate at 5 years was 64%, the PFS was 34%, and OS was 70%. Results from a recent, large, randomized phase III study (LYM-3001) of rituximab alone vs. rituximab and bortezomib for relapsed/refractory FL showed higher OR and CR rates and prolonged PFS for bortezomib-rituximab: median PFS was 12.8 months for bortezomib-rituximab and 11.0 months for rituximab alone (p = 0.039) . The combination also resulted in a significantly greater OR rate (63%) and CR rate (25%) than rituximab alone (OR 49%, p = 0.0004; CR 18%, p = 0.035). In addition, high-risk patients with FL treated with bortezomib-rituximab showed a significantly higher OR rate and longer PFS than those receiving rituximab alone; the clinical benefit was greater than in the overall study population . However, after a median follow-up of 33.9 months, OS between arms was similar. The effect of replacing bortezomib-rituximab with vincristine-rituximab in the treatment of relapsed or refractory patients with FL or marginal zone lymphoma was examined in a phase II study . The patients received six 21-day cycles of bortezomib 1.6 mg/m2 (days 1, 8), rituximab 375 mg/m2 (day 1), cyclophosphamide 1000 mg/m2 (day 1), and prednisone 100 mg (days 1–5) (VR-CP), or bortezomib, rituximab, and prednisone as in VR-CP plus cyclophosphamide 750 mg/m2 and doxorubicin 50 mg/m2 (day 1) (VR-CAP). With VR-CP, the OR rate was 77% and the CR rate was 27%. After a median follow-up of 10.9 months, 40% of patients had relapsed/progressed or died. The median OR was 21.9 months and PFS was 14.9 months. Diffuse large B-cell lymphoma (DLBCL) constitutes 30–58% of all patients with NHL, with an incidence of 3.8/100,000/year [140, 141]. There are two distinct molecular subtypes of DLBCL: germinal center B-cell like (GCB) and activated B-cell like (ABC) DLBCL, with non-germinal center B-cell-like DLBCL (non-GCB DLBCL) having a worse prognosis and shorter survival after first-line immunochemotherapy. In early studies, bortezomib has shown activity in DLBCL, especially in the non-GCB DLBCL subtype. Dunleavy et al. investigated bortezomib alone followed by bortezomib and doxorubicin-based chemotherapy in patients with relapsed/refractory DLBCL . While bortezomib alone had no activity in DLBCL, bortezomib combined with chemotherapy induced a significantly higher OR in the ABC subtype than the GCB DLBCL (83% vs. 13%, respectively; p <0.001). Median OS was also longer in the ABC DLBCL subtype (10.8 months) than in the GCB subtype (3.4 months; p = 0.003). These results indicated that bortezomib enhances the activity of chemotherapy in relapsed patients with the ABC but not GCB DLBCL subtype. Ruan et al. evaluated bortezomib plus standard R-CHOP in 76 previously untreated patients with aggressive NHL including 40 patients with DLBCL and 36 with MCL . For patients with DLBCL, the OR rate was 100% with 86% CR/CR unconfirmed; the 2-year PFS was 64% and the 2-year OS was 70%. Importantly, non-GCB and GCB subtypes had similar results. The R-CHOP regimen, with or without bortezomib, has recently been compared as part of a randomized phase II study in 183 previously untreated patients with non-GCB DLBCL . Patients randomly received up to six 21-day cycles of standard R-CHOP alone or R-CHOP plus bortezomib 1.3 mg/m2 intravenously on days 1 and 4 (VR-CHOP). In this study, the outcome was not significantly improved by adding bortezomib to standard R-CHOP. Two-year PFS rates were observed in 77.6% of patients treated with R-CHOP and 82.0% treated with VR-CHOP. The OR rate was 98% for R-CHOP and 96% for VR-CHOP. Two-year survival rates were also similar: 88.4% and 93.0%, respectively. Offner et al. compared frontline VR-CAP with R-CHOP in previously untreated patients with non-GCB DLBCL in a phase II study . However, in contrast to MCL, it was found that substituting bortezomib for vincristine in frontline R-CHOP therapy did not improve the efficacy of therapy in this type of DLBCL. No significant differences were observed between VR-CAP and R-CHOP with regard to the OR rate (93.4% and 98.6%, respectively; p = 0.11), CR rate (64.5% and 66.2%, respectively; p = 0.80), or OS (p = 0.75). The two types of therapy also demonstrated similar rates of grade ≥3 AEs (88%, 89%), serious AEs (38%, 34%), and grade ≥3 peripheral neuropathy rates (6%, 3%). Plasmablastic lymphoma is a rare, aggressive, and usually CD20-negative subtype of DLBCL, often associated with human immunodeficiency virus infection NHL . Although there are no treatment recommendations or standards of care for this disease, the combination of bortezomib with chemotherapy may be an effective treatment option in some patients with plasmablastic lymphoma. Despite the small number of patients, the available results are encouraging and offer hope for the clinical use of bortezomib-based regimens in patients with plasmablastic lymphoma . Acute lymphoblastic leukemia (ALL) is the most common malignant disorder in patients aged younger than 15 years, accounting for 26% of all cancers and 78% of leukemias in this age group, and for approximately 20% of adult acute leukemias . A recent study investigated the use of bortezomib in re-induction chemotherapy with dexamethasone and vincristine in relapsed or refractory pediatric ALL . The drug was randomly given at a dose of 1.3 mg/m2, either early or late, to a dexamethasone and vincristine backbone. After one cycle, eight of 25 (32%) patients obtained CR with incomplete blood count recovery (CRi); seven patients (28%) obtained a PR, half of whom improved to CR after a second cycle. Better results were achieved in the Therapeutic Advances in Childhood Leukemia & Lymphoma Consortium T2005-003 study. Patients who failed at least two prior regimens received bortezomib combined with dexamethasone, vincristine, doxorubicin, pegylated asparaginase, and doxorubicin, yielding a CR rate of 64% . In another study that used the same regimen, five out of seven patients with T cell-acute lymphoblastic leukemia achieved CR or CRi . Acute myeloid leukemia is the most common acute leukemia diagnosed in adults, with an annual incidence of approximately 22,000 cases in USA in 2017 . Early studies have indicated that bortezomib is potentially useful in the treatment of AML. However, when bortezomib was used as single agent in relapsed/refractory patients with untreated AML or relapsed/refractory patients with AML, unsuitable for conventional chemotherapy, its activity was low . Attar at al. 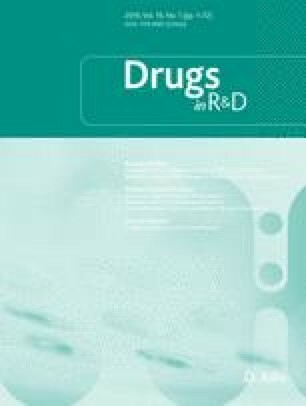 evaluated bortezomib therapy administered in addition to standard 3 + 7 daunorubicin and cytarabine induction chemotherapy followed by consolidation with bortezomib and intermediate-dose cytarabine in patients with CR . Escalating doses of bortezomib (0.7 mg/m2, 1.0 mg/m2, and 1.3 mg/m2) were evaluated in previously untreated elderly patients with AML, with an encouraging CR rate of 65% and four CRi observed in 95 evaluated patients. Grade 3 sensory neuropathy was observed in 11 patients. Walker et al. combined azacitidine with bortezomib in 23 adults with relapsed or refractory AML in a phase I study . Five of 23 patients responded, including two with morphologic and cytogenetic CR and three with CRi. Three of four CR/CRi responders with cytogenetic abnormalities at baseline achieved cytogenetic CR. The combination of azacitidine and bortezomib was tolerable and active in poor-risk previously treated patients with AML. T-cell lymphomas include several rare lymphoid malignancies such as cutaneous T-cell lymphoma and peripheral T-cell lymphoma. Peripheral T-cell lymphoma is a heterogeneous group of aggressive lymphomas with a poor OR rate and shorter PFS than B-cell lymphoma. Peripheral T-cell lymphomas include angioimmunoblastic T-cell lymphoma, anaplastic large cell lymphomas, peripheral T-cell lymphoma, not otherwise specified, and intestinal T-cell lymphomas . In these disorders, bortezomib can be considered as therapy for refractory or relapsed disease . In one study, bortezomib was evaluated in 12 patients with relapsed or refractory cutaneous T-cell lymphoma and peripheral T-cell lymphoma, not otherwise specified with isolated skin involvement . Bortezomib was used as a single agent at a dose of 1.3 mg/m2 intravenously on days 1, 4, 8, and 11, every 21 days for a total of six cycles. The OR rate was 67%, including CR in two patients. In other phase II study performed in 46 patients with peripheral T-cell lymphoma with different histological subtypes, bortezomib was combined with CHOP . Bortezomib was administered on days 1 and 8 at a dose of 1.6 mg/m2, in addition to CHOP every 3 weeks for a total of six cycles. The OR was 76% including the 65% CR. Peripheral T-cell lymphomas, not otherwise specified, angioimmunoblastic T-cell lymphomas, and anaplastic large cell lymphomas demonstrated an 87% OR rate and a 73% CR rate. However, the treatment efficacy for extranodal natural killer/T-cell lymphoma, nasal type was poor, with a CR rate of only 30%. The 3-year PFS was 35% and the OS was 47% owing to the frequent relapses after remission. These results appear to be superior to treatment with CHOP alone. The most common toxicity was neutropenia, which was mainly associated with CHOP chemotherapy. Bortezomib demonstrates antiproliferative and antitumor activity via the inhibition of the proteasomal degradation of several regulatory ubiquitinated proteins. The drug has been found to have proven clinical efficacy in MM, MCL, WM, T-cell lymphomas, and other lymphoproliferative disorders, both as a single agent and in combination with other drugs. In these diseases, bortezomib acts synergistically with several chemotherapeutic agents and targeted drugs. In 2003, bortezomib was approved for the treatment of refractory/relapsed MM and in 2006 for refractory/relapsed MCL. Subsequently, bortezomib was approved for previously untreated patients with these diseases. Multiple ongoing studies are currently evaluating combination regimens involving either cytotoxic or targeted therapies, with the ultimate goal of prolonging survival in lymphoid malignancies. A better understanding of the mechanisms of bortezomib resistance is required for the development of novel therapeutic strategies, particularly for refractory and relapsed patients. In addition, the introduction of newer proteasome inhibitors (e.g., carfilzomib, ixazomib, or marizomib) with activity in bortezomib-resistant disease and reduced toxicity may be also of value. We thank Edward Lowczowski and Anna Rychter from the Medical University of Lodz for editorial assistance. This work was supported in part by a Grant from the Narodowe Centrum Nauki (NCN) (2016/23/B/NZ5/02529). Pawel Robak and Tadeusz Robak have no conflicts of interest that are directly relevant to the content of this article. Howlader N, Noone AM, Krapcho M, Garshell J, Neyman N, Altekruse SF et al. SEER Cancer Statistics Review, 1975-2010, National Cancer Institute. Available from: http://seer.cancer.gov/csr/1975_2010/. Accessed 8 Apr 2019. Surveillance Epidemiology and End Results Program of the National Cancer Institute. SEER cancer stat facts: acute myeloid leukemia (AML). 2018. Available from: https://seer.cancer.gov/statfacts/html/amyl.html. Accessed 31 Oct 2017.